Savage Opress is a beast in the early stages of the game with four damage sides, it's almost impossible not to hit damage. On top of that he has an amazing health pool boasting 13hp and combined with his low points cost 11/14e, he is a monster. If he didn't have his ability that forces him to activate out as his first action every round he probably would have been the BEST CARD in the set. Insane damage dice that are hurting a lot in a Melee based deck that, and the +2 Melee damage and 3 Melee damage for 1 resource can be absolutely devastating round 1. Although FFG has pushed the health pools up quite a bit lately, 13 health is still at the high end of the scale and killing this guy is a tall mountain to climb. 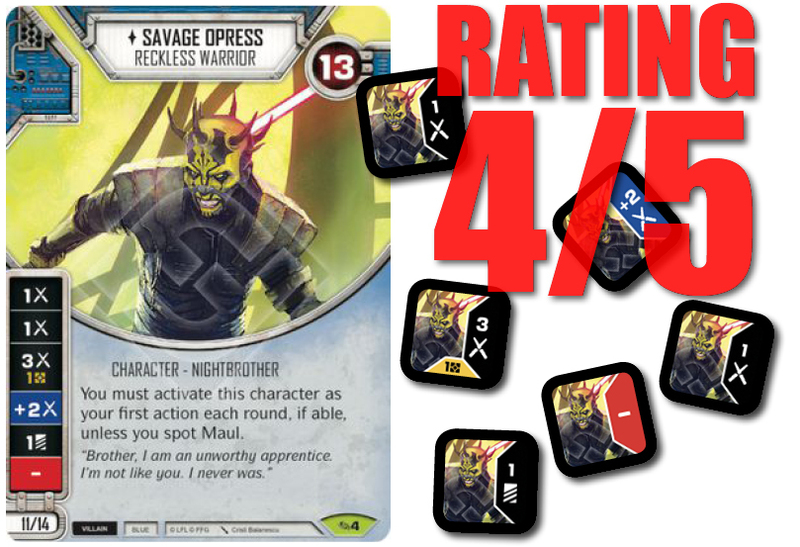 Savage Opress is relatively simple to play as his 'negative' trait limits your choices, which is particularly awesome for new players, because he actually helps you out with sequencing during the game! Having to activate first IS a liability! In particular if you wanted (needed) to do something else, i.e. mitigate dice or play upgrades. While Opress' die is pretty obscene, it has no Resource side, which makes almost any deck you play him in pretty resource starved because his die also has a payside. 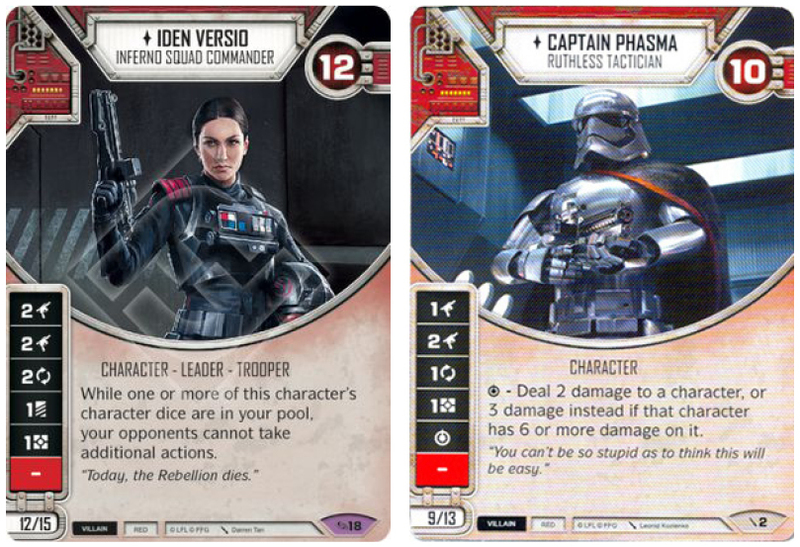 CRAFTED LIGHTSABER is usually a pretty bad card to add to any deck (outside of General Grievous decks), but depending on your Savage Opress character pairing more often than not people tend to focus down his sidekick. That means activating Savage, check if you hit a payside, if not you're free to play the Crafted Lightsaber and get ready for the next round, which should have the potential to do some serious damage. BLOODLUST is an ok'ish card, but normally you'd prefer to spend your 2 resources round 1 for a weapons upgrade instead, but as Savage prohibits that play, while you can still play the Bloodlust after activating Savage and get full benefit from it! His 4 damage sides are now essentially, 2M/2M/+3M/4M ... that should make your opponent pretty scared! FORCE SPEED is actually also a good upgrade on Savage. Sure, you don't get any use of it round 1, but that's also where the Force Speed usually is the least impactful on the game. In subsequent rounds though, activating him with a Force Speed and either Crafted Lightsaber/Bloodlust can be absolutely menacing for your opponent. 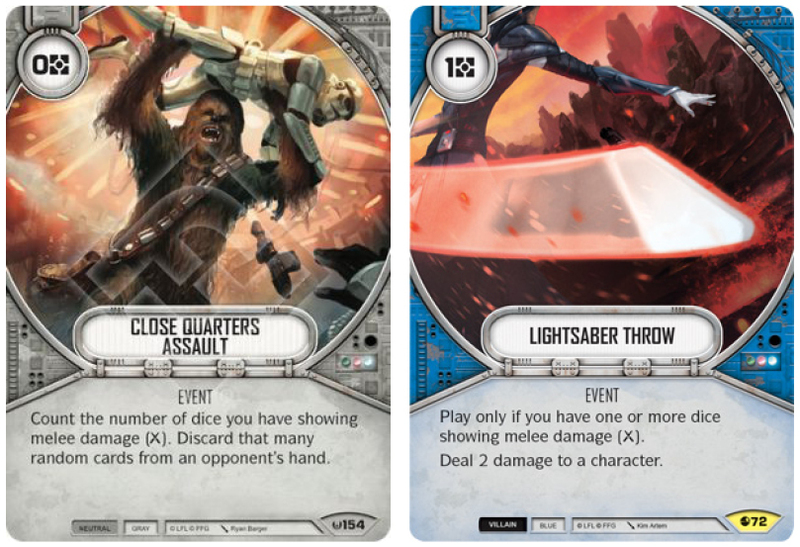 With so many Melee sides in your deck, you are almost assured to be able to pluck 2-3 cards from your opponent's hand - and that is just bananas.There's a reason why Close Quarters Assault has featured prominently in both decks that have won Worlds (2017 and 2018) ... it's good! It is amazing with Savage if you decide to go full aggro. Round 1 you roll that 3 Melee for 1 side which means, i you resolve it, you won't be able to afford an upgrades! Play the Lightsaber Throw for 2 out of hand damage, and your up to 5 damage from 1 die. This is maybe my favorite card of the set for Savage Opress! If you are on the bad side of variance, and don't manage to find any damage, Conflicted gives a 66% chance of rerolling into damage AND on top of that deal 2 damage. MAD! And even if you are unlucky you still get two shields, so essentially played a Defensive Stance. AND your die is still in the pool allowing you to reroll later for damage. This character wants to hit hard and kill characters fast. If you do decide to go monoblue a welltimed No Mercy can easily snipe off a character round 1! WHOM TO PAIR HIM WITH? Because of his ability I think you want to play a fast deck, allowing you to claim and gain initiative. Retaining initiative in the mid to late game minimises Savage's negative effect as you'd most likely want to activate him first anyways! That's why I don't think going 3wide is the stronger strategy with Savage. 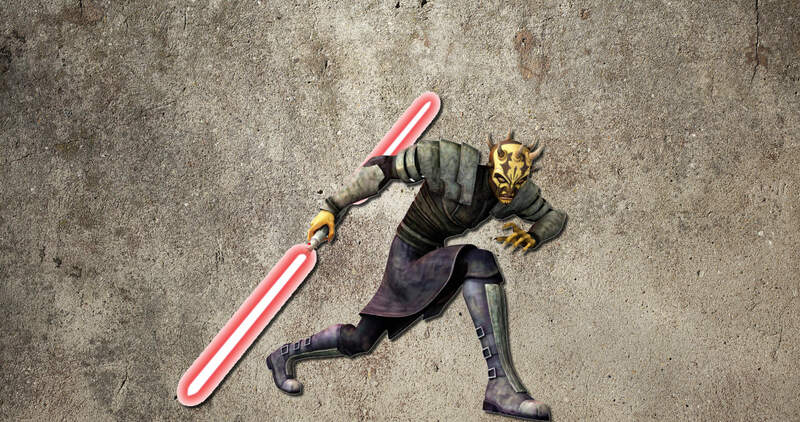 So, you can pair him with plenty of characters, and while Maul obviously comes to mind, to negate his ability, and unleash the full potential of Savage, there are lots of other options. 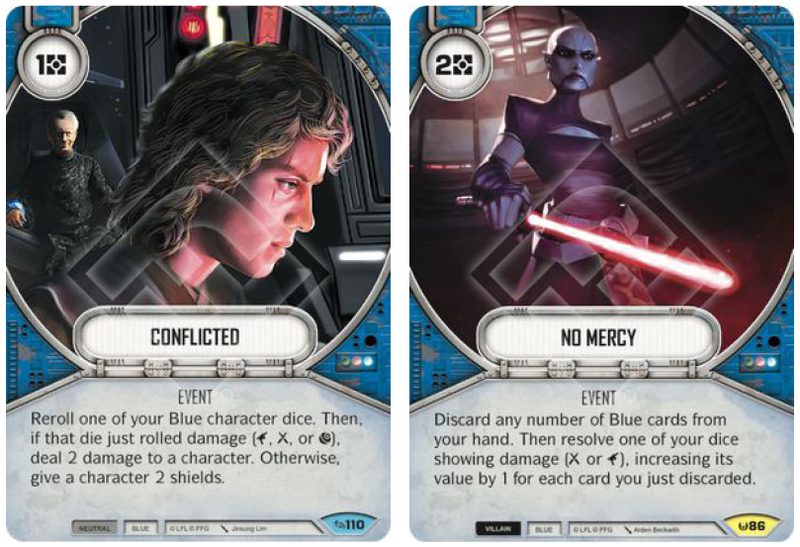 I feel that pairing him up with Maul can either be a SUPER devastating deck or just a wrong take through and through. I'm mostly sceptical because Maul is such a BAAAAD character. 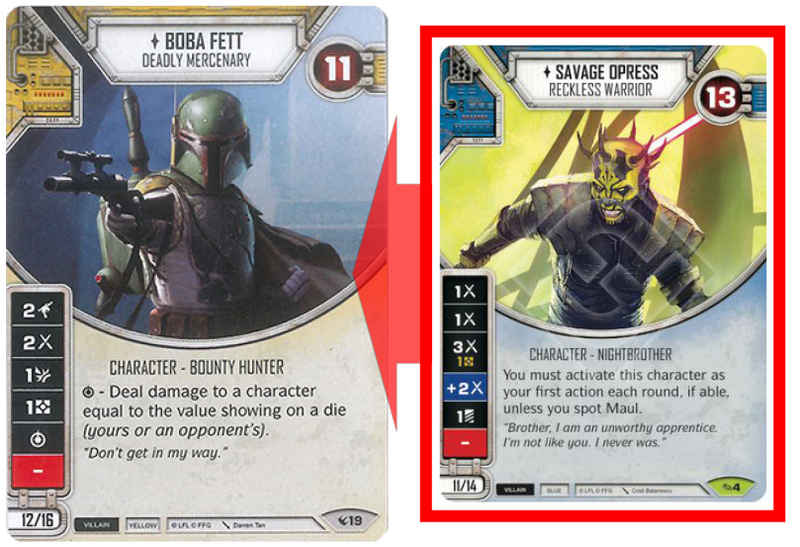 Another obvious pairing is everybody's favourite bounty hunter Boba Fett to add a splash of Yellow and get access to great cards like Truce and Backup Muscle, while Boba's Special can do some serious work with Savage's 3 Melee side or combine with Iden Versio/Captain Phasma for a Blue/Red combo. Red offers you the possibility of speeding things up with Tactical Mastery, which would add some speed to your deck and help you claim the Battlefield. But throughout my testing with Savage, what I found to be the most successful combo is adding in the Solidarity plot and pair him with the ultimate aggro dude Kylo Ren! The downside is that by playing Solidarity to afford both characters, you limit yourself to playing just 1 of every card. This makes some of the most powerful plays, i.e. Close Quarters Assault, harder to achieve at the right time in the game. Yet, there are enough similar cards to make this a fairly consistent aggro deck. What you do get with Kylo is the consistency of damage. So, you're looking at Savage with 8 of 12 dice sides being Melee damage and Kylo Ren following suit with 6 out of 12 showing Melee. 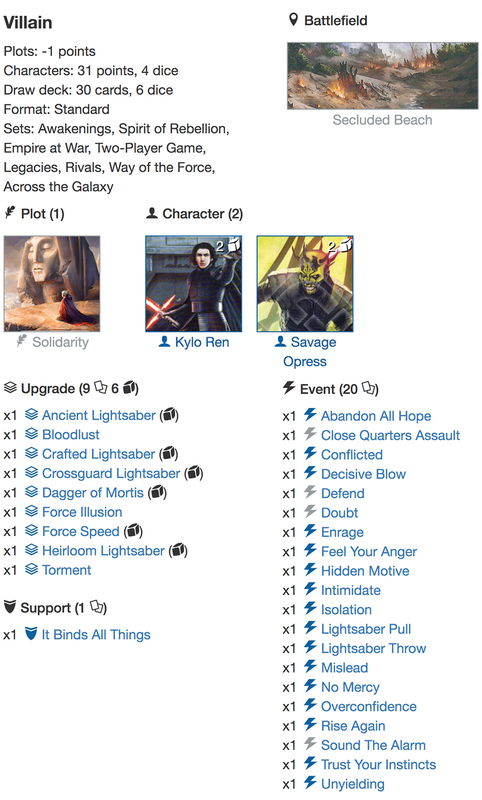 Savage should reliably be able to do 3-4 damage by himself and Kylo with his dice 2-3 damage with rerolling, add to this Kylo's activation ability for another 2 damage and you'll find that doing 7-9 damage round 1 is a VERY probable scenario. Draw into a Lightsaber Throw and you can push it to 11 damage. ROUND 1. I believe that this is the "perfect match" for Savage in the beginning of the meta where usually people are playing quite few removal cards. 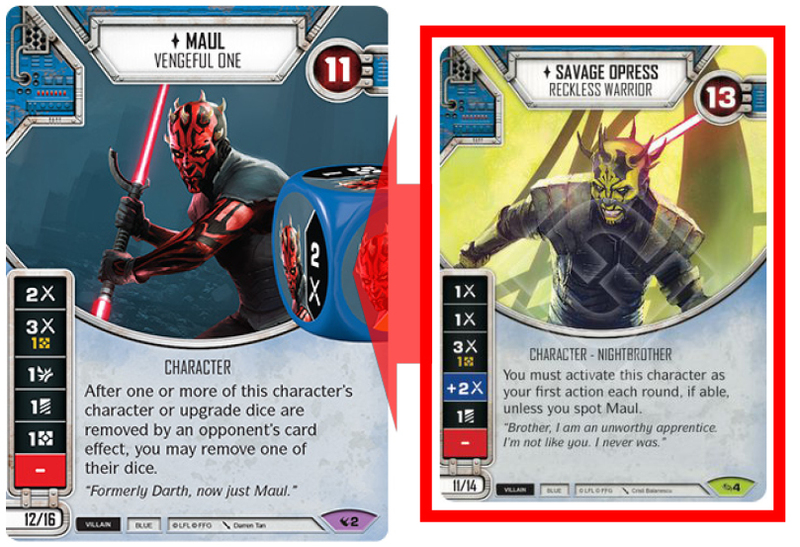 I see Maul as a dark horse that possibly could make for a better deck. But my proposal for a deck boasts 25hp, and offers amazing consistency with dice, and a quite decent chance of killing off characters round 1 or 2.